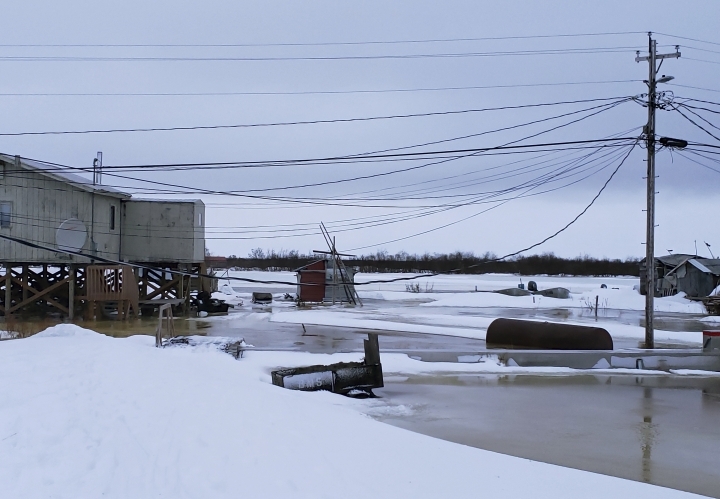 ANCHORAGE, Alaska — The Yupik Eskimo village of Kotlik on Alaska's northwest coast relies on a cold, hard blanket of sea ice to protect homes from vicious winter Bering Sea storms. Frigid north winds blow down from the Arctic Ocean, freeze saltwater and push sea ice south. The ice normally prevents waves from forming and locks onto beaches, walling off villages. But not this year. 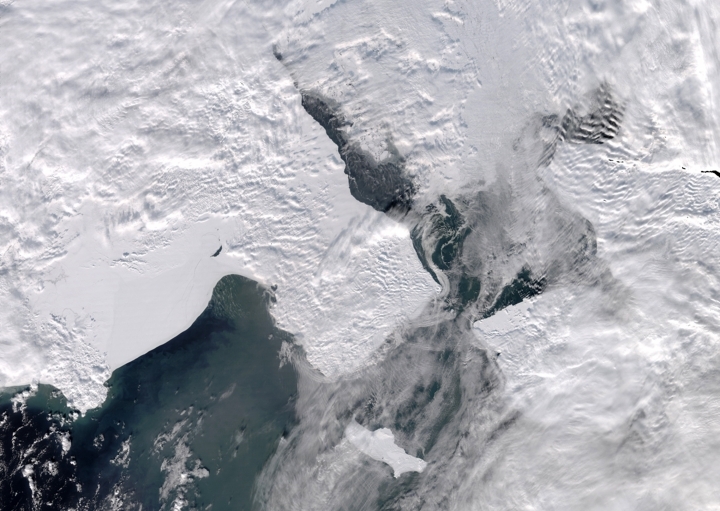 In February, southwest winds brought warm air and turned thin sea ice into "snow cone ice" that melted or blew off. 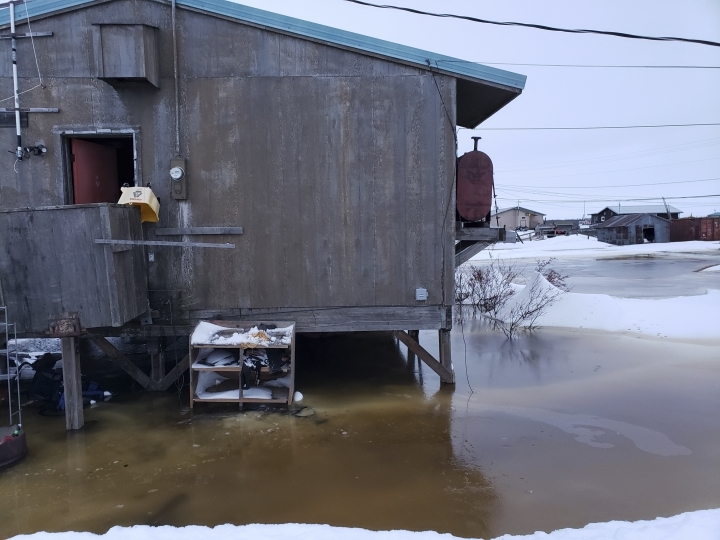 When a storm pounded Norton Sound, water on Feb. 12 surged up the Yukon River and into Kotlik, flooding low-lying homes. Lifelong resident Philomena Keyes, 37, awoke to knee-deep water outside her house. "This is the first I experienced in my life, a flood that happened in the winter, in February," Keyes said in a phone interview. Winter storm surge flooding is the latest indication that something's off-kilter around the Bering Strait, the gateway from the Pacific Ocean to the Arctic Ocean. Rapid, profound changes tied to high atmospheric temperatures, a direct result of climate change, may be reordering the region's physical makeup. Ocean researchers are asking themselves if they're witnessing the transformation of an ecosystem. The Bering Sea last winter saw record-low sea ice. Climate models predicted less ice, but not this soon, said Seth Danielson, a physical oceanographer at the University of Alaska Fairbanks. "The projections were saying we would've hit situations similar to what we saw last year, but not for another 40 or 50 years," Danielson said. Walruses and seals use sea ice to rest and give birth. 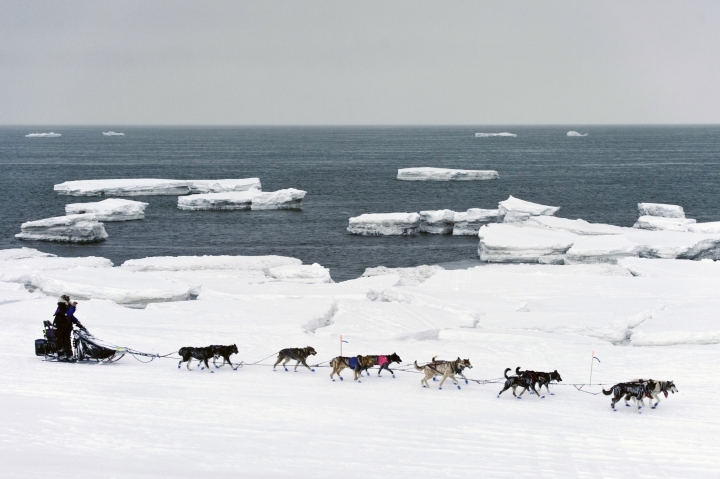 Villagers use sea ice to hunt them. Sea ice is the primary habitat of polar bears. Algae that clings to the bottom of sea ice blooms in spring, dies and sinks, sending an infusion of food to clams, snails and sea worms on the ocean floor — the prey of gray whales, walruses and bearded seals. Sea ice also affects commercially valuable fish. Sea ice historically has created a Bering Sea "cold pool," an east-west barrier of extremely cold, salty water at the bottom of the wide, shallow continental shelf. The wall of cold water historically has concentrated Pacific cod and walleye pollock in the southeastern Bering Sea. "It tends to extend from the Russian side to the northwest," said Lyle Britt, a fisheries biologist for the National Oceanic and Atmospheric Administration. "It kind of comes down almost like a little hockey stick shape ... through the center of the southeast Bering Sea." However, when Britt and other NOAA researchers last year conducted annual fish and ocean condition surveys, they got a big surprise: For the first time in 37 years, they found no cold pool. Researchers found high concentrations of Pacific cod and walleye pollock in the northern Bering Sea. But the species that was supposed to be there, Arctic cod, was hardly found. More than half the fish landed in U.S. waters come from the North Pacific, and most are caught in the Bering Sea. Chad See, executive director of the Freezer Longline Coalition, a trade association of vessels that target Pacific cod using baited lines, said members caught their quota last year but had to travel farther north. "Does that mean that the stock is declining, is suffering because of the warming temperatures? Or is it that they've moved north and it's still a vibrant fishery?" See said. It's too soon to conclude that atmosphere and ocean changes are due simply to climate change, said NOAA physical oceanographer Phyllis Stabeno, who has studied the Bering Sea for more than 30 years. The southern Bering Sea since 2000 has undergone multi-year stanzas of low and extensive ice, she said. When sea ice in November began forming as usual, she expected a bounce-back this winter. Instead, warm winds in February mostly cleared the northern Bering Sea of sea ice through the Bering Strait into the Chukchi Sea. "We're in winter," she said. "This is all supposed to be frozen." Formation of the cold pool is again in doubt. It could return in the future, but temperatures are trending upward with the rate of greenhouse gases entering the atmosphere. Scientists say figuring out the ocean physics is far less of a challenge than projecting the biological ramifications. "We sort of opened up this whole Pandora's box of not really knowing how the ecosystem as a whole is going to adjust to that," Danielson said. The U.S. Fish and Wildlife Service and the National Park Service early last summer detected trouble. Resident called with reports of emaciated and dead seabirds. Common murres, which can use up fat reserves and starve after three days without eating, fly hundreds miles to find fish schools or krill but were washing up dead on shore. Forktail storm petrels, fulmars, shearwaters, kittiwakes, auklets and puffins also died. No one can say why. Seabird experts wonder whether the presence of more pollock and Pacific cod, which have voracious appetites and are far more efficient hunters of forage fish than seabirds, was a factor. Dean Stockwell, a research associate professor at the University of Alaska Fairbanks with a specialty in phytoplankton, said the ocean changes have the potential to affect plant life at the bottom of the food web but it's too soon to know. Of immediate concern is whether warmer water will allow harmful algae containing toxins to stay viable long enough for shellfish to eat them and pass toxins to marine mammals and people. Toxins are being carried to the Arctic, Stockwell said. "The question with global warming types of things is, 'Can it get a foothold? Can they do damage?'" he said. Seabird experts wonder if toxins played a role in recent seabird deaths by affecting their ability to forage. No one has connected the dots, said Britt, the NOAA fisheries biologist. "At the moment, nobody's sitting with in-hand a comprehensive research study that covers the birds and the mammals and the fish and the zooplankton all in one synthesized report," he said, adding that it will take researchers more time to figure out what's going on. Meantime, Kotlik resident Keyes is researching climate change effects in her coastal village of 650 as project coordinator for a team working under a Bureau of Indian Affairs program. The absence of sea ice since mid-February meant taking land routes to visit nearby villages, she said. And seal hunters this spring found bearded seals to harvest but not near the village. Like the cod fishermen, "They had to go farther north," Keyes said.